Over the past few years, I have been asked to add a little more personal flair to the blog. My readers have been curious about daily life around the Parrot Earth house and I decided that in 2015 I would give up the goods and open up a bit more. As some of you know we had just moved into a new house, it’s was a long time to get here, but none the less here we are. I am very proud of all that we have accomplished and we have a beautiful home to show for it. However, “with the sweets comes the sours”. A couple of months into residency at Greywood House (yes we named the house, how back east) we had a leak in the roof that leaked down an upstairs wall and puddled in the basement ceiling. Now let me tell you, I was not please, especially since we got a “roof certification” which we were told that the roof would last a minimum of five years before needing any work. Well come to find out a roof certification is not worth the paper it’s really printed on (for you future home buyers). It’s just a piece of paper for the bank so the financing on the the loan will go through. That was lesson number one. Fast forward two and a half months to another leak, this time upstairs coming out of the smoke detector (thankfully it notified us through the alarm company, otherwise we would have not known until morning) and eventually a hole in the ceiling while trying to find the leak. Yep, I said a hole in our lovely new ceiling, which has since been patched and only took a month to find someone to do it. Not the dreams that most new homeowners want realized. “Why is your roof leaking?”, you may be asking yourself… well let’s talk irony shall we? As you are reading this you know Parrot Earth and the work that I strive to do for parrots. I even try to do my part for wild birds and feed them in the back yard with feeders here and there. Let’s not to forget to mention the hummingbird population, because who doesn’t love those little guys? Two words spring to mind when answering the question of what is doing damage to our roof. Simply put, it’s THE BIRDS! I got the little flicker here. Yes, you read that correctly BIRDS and one in particular, described on internet sites as “The Glorious Northern Flicker Woodpecker” was the culprit. In the Pacific Northwest there are these trees that I do not particularly care for and are called pine trees, and yes I am aware I live in the wrong state not to like pine trees, let’s move on shall we? They inhabit almost every nook and cranny and are quite messy. Interesting enough, our property is surrounded by them and their lovely little needles that they drop EVERYWHERE gather in the valleys of our new home’s roof and attract birds. Birds, more importantly the newly renamed “The Little Flicker” comes along and look for bugs. Their sharp little beaks punch holes in the roof like a precision drill, therefore bringing the Seattle drizzle right into your living room. After days upon days of research, we made the decision to try measures that would be both affordable and gentle to the environment. To buy your own Maybe or Mavis, click here. Welcome Mavis and Maybel, our decoy owls. Mavis is solar-powered and her head moves every minute, or with every little gust of wind. After pulling them out of the boxes our dogs, Sheldon and Baron were terrified of the decoys. I took that as a good sign, considering they didn’t know what an owl was. So, on the roof they went and it appears that birds in the general vicinity have taken a leave to a couple of houses down. There was a recommendation that they be moved every so often, so they don’t start to blend in the with the scenery. We also tied Irritape to the roof, which is a loose era decent streamer looking thing that spooks birds if they come near it, because it changes color and looks like it moving. Irritape doesn’t last as long as you would like it to in a windstorm. In fact it whips around and snaps, of which you will no doubt find the pieces in your yard, but at least they are pretty. Another thing that worked AMAZINGLY well while we were coming together with our game plan was a suggestion from my mother-in-law. Mylar balloons from the local dollar store. Blue, red and silver were the variety we bought and tied them to just about anything that we could. They moved enough and had a reflective surface that frightened off any potential roof damaging little Flickers. I am not pictured here. We consulted a roofing specialists in our area and were going to replace the valleys on the house with metal flashings, so the needles no longer gather. After time and budgeting, we were able to add the flashing to the valleys of the roof ourselves, which ended up saving us about $1000 and that was music to my ears. Streaming wind socks of different shapes and sizes were also added to the roof as a deterrent. Also my bird buddy Irena Schultz suggested that we provide food for the little Flickers in the form of suet feeders placed here and there on the property, which I gladly did. I try not to be mad at the little flicker for doing what nature has programmed him to do, however the costs weren’t helping my forgiving attitude, nor my naturalistic outlook. 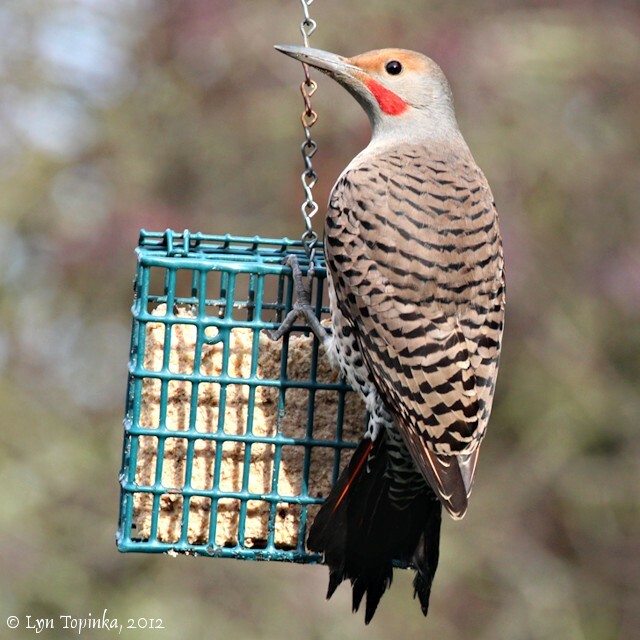 It’s been two months since “The Glorious Northern Flicker” seemed to go on his merry way. Was it the solar owls on the roof, was it the irritape? Could it have been the mylar balloons? Possibly the windsocks or the metal flashing? Or was it all of it. I can honestly laugh about the situation now, kind of. We went through some sleepless nights during that time and I went through a lot of hours on the internet and phone talking to experts on what could be done. Let’s not forget the bottles of vodka, but that’s off the record. But hey… At least no birds were harmed in this learning experience. Hopefully someone can use some of these tips before they incur thousands of dollars of damage! But really, who thought it would have been The Birds, No Seriously The Birds! Copyright – 2015 – Parrot Earth – The Birds, No Seriously The Birds! !